UNITED NATIONS, May 24 -- Macedonian diplomat and media figure Srgjan Kerim was selected Thursday as the next president of the UN General Assembly. Once he was selected by the Eastern European group, in a process that was not public, he was a shoo-in. At a UN press conference on Thursday afternoon, Inner City Press asked Mr. Kerim, since he has served as a spokesman and now manages Germany's WAZ media group for southeast Europe, if he will improve the GA's openness to the press and public. Specifically, will he ensure that the GA's Advisory Committee on Administrative and Budgetary Questions, the ACABQ, at least responds to press inquiries? A recent request concerning ACABQ's review of the "urgent audit" of the UN Development Program in North Korea, sent to Mark Gilpin in the ACABQ's secretariat, was not even responded to. Mr. Kerim said, "Not only as a media man... we have to be transparent. There must not be hidden agendas or mystification in this organization." Mr. Kerim: mystification stops here? The prospect of a full year, beginning in September, without mystification, had several reporters shaking their heads. GA spokesman Ashraf Kamal quickly brought them back down to earth. "ACABQ is not open to anyone," he said. "But they don't even answer their email--"
"They shouldn't," said Mr. Kamal. Video here, from Minute 11:33. He added that the GA's Fifth Committee is already slow enough, without having more open meetings. Inner City Press also asked Mr. Kerim about climate change, as the UN's Yvo de Boer earlier on Thursday had said it will be up to the next GA president to decide how the GA handles the issue. 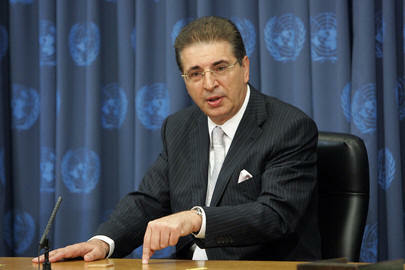 "The Sixty Second General Assembly would be a failure if it does not deal with this issue," Mr. Kerim said. Yvo de Boer spoke of the climate change meeting in Bali this coming December. Inner City Press asked him about a statement by the U.S.'s Harlan Watson that, on reducing greenhouse gas emissions, "a long term target is a political, not a scientific one." Mr. de Boer did not respond directly, but rather said that the U.S. might disagree that the Bali meeting is the right time to make a target, and might not disagree with the concept of targeting. It might not, and it is surely wise diplomacy to be polite in this way, similar to Tony Blair's, Thursday on BBC, or to the UN's Dr. David Navarro's approach to countries on bird flu. But it can be a fine line between remaining relentless upbeat and losing credibility. Mr. de Boer called himself "dangerously optimistic." The applicability of the first of those two words should not be underestimated.